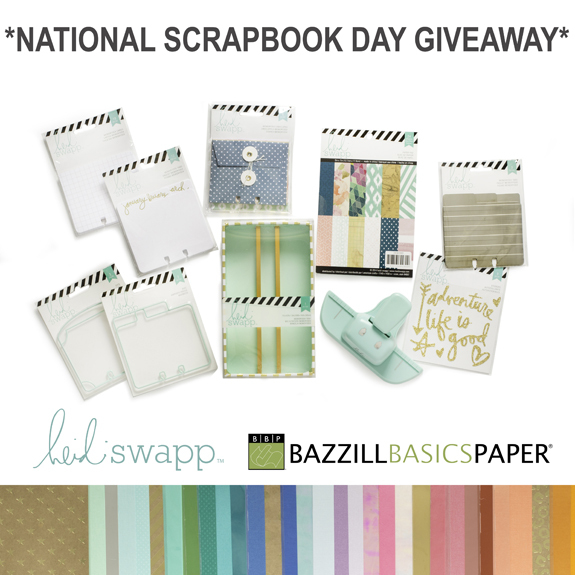 Bazzill Basics: Happy (Inter)National Scrapbooking Weekend! Scroll down to visit Pink Paislee's Blog Hope Event! Happy National Scrapbook Weekend! The Bazzill Basics design team is excited to celebrate with you! Today we want to share some inspiration to help kick off your weekend creativity! Make sure you start at the Bazzill Basics' blog! There was a time in my life where I was a single teacher. I thought the only stories I had worth telling were about the children in my class. It's sad really. All those years of my life I thought weren't worthy of documenting. It would have been nice to have photos of my life before I was married. It's over fifteen years later and now I make sure I am in my albums. I love to tell my own story. What I love, what makes me happy, and to share my thoughts about life for my children to read about later when they are older. Most of all, I love to scrapbook because it's easy to remember those hard times. It's harder to remember the good - those little things that make up everyday happiness. Maybe you can understand. Life isn't easy. Remembering life can be even harder (especially if you are a mother of small children). I think a good memory comes with a full nights sleep and that doesn't happen until your child is a teenager! Ha! It is one of the reasons why I love memory keeping and this holiday! It's a way to celebrate documenting the everyday! It's also a way to connect with other friends who "get you", like the Bazzill Basics design team. I love Kelly who is next on the hop! Not only is she a sweetheart in real life, but she is so inspirational! Head over to her blog now to see what she has created! Make sure to hop through so that you can learn how to enter this HUGE prize pack including Bazzill's new specialty foam, foil board, and mylar papers and Heidi Swapp's Wanderlust collection! Create Often: Document the good in everyday so you can remember during the storm. Lovely layout! I love reliving parts of my life through my scrapbook pages! My kids are currently "on strike" (not happy about being the focus of my pages) so I'm doing a lot more scrapping of me and I'm loving it! Scrapbooking is definitely something I hope to do for the rest of my life! I hope I never run out of stories that need to be told!